ŠKODA is making the Superb an even more tempting proposition for buyers thanks to the introduction of a new SportLine Plus model and a raft of extra equipment for the Superb. The range expansion celebrates the incredible success of the Superb in the UK, and further distances ŠKODA’s award winning hatch and estate from the sector competition. The new SportLine Plus model is priced from £29,330 OTR and has been added to the range to meet significant customer demand. Combining the striking design package of the standard SportLine model with a raft of additional equipment, it delivers even better value for money for customers. SportLine Plus models are equipped with Columbus satellite navigation with 9.2-inch touchscreen display and integrated Wi-Fi, heated front seats, blind spot detection, electronically operated boot and progressive dynamic steering. Despite this impressive quantity of additional equipment, the SportLine Plus model only commands a £1,500 premium over the standard model – a 40 per cent saving over the individual option costs. Available to order from today (4 April), the SportLine Plus is priced at £29,330 for the hatch version, and £30,645 for the Estate. A choice of three petrol and two diesel engines is offered, with the option of four-wheel drive and six-speed DSG automatic gearbox. The range-topping 2.0-litre TSI 280PS 4X4 can sprint from 0-62mph in just 5.8 seconds, while the 2.0-litre TDI 150PS emits just 113g/km, making it an attractive option for company car buyers. Featuring 19-inch Anthracite Vega alloy wheels, sports design bumpers, sunset glass, and black gloss trim treatment on the grille, wing mirrors and window surrounds, the Hatch version has a rear black spoiler while the Estate has black gloss roof rails and a body-coloured spoiler. The standard kit list also includes Bi-Xenon headlights, front and rear parking sensors, Drive Mode Select, dual-zone climate control, KESSY keyless entry and cruise control. A sports chassis lowers the car’s ride height by 15mm, and an XDS electronic differential lock ensures sharper handling. Interior enhancements include a three-spoke Super Sport multifunction steering wheel with silver stitching, quilted Alcantara sports seats, LED ambient lighting, carbon dashboard trim, aluminium pedals and black headlining. As part of the range update, the standard SportLine model has been reduced by £470 and its specification realigned to include the Amundsen 8-inch satellite navigation system in place of the Columbus system. This means that buyers can access the sporty looks of the SportLine for an even more affordable price. It’s not just the sporty models that benefit from an update. All models except the entry-level S receive a boost in equipment at no additional cost. SE and SportLine models gain front and rear parking sensors, while SE L Executive models gain front and rear parking sensors, Blind spot detect, Keyless entry and a colour trip computer. Range-topping L&K models gain even more equipment with a heated multi-function steering wheel, ventilated seats and rear-view parking camera all added to the standard specification list. 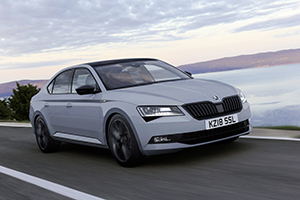 All updated Superb models are available to order from 4 April 2018 with deliveries of the new SportLine Plus model expected late June.